My History Channel desktop calendar did not mention anything about the assassination of Dr. Martin Luther King, Jr. I may be making a ginger deal of it than it needs, but I talk about it here. My beautiful wife put a History Channel 2013 desk calendar in my stocking at Christmas. As a history nerd, it was right up my alley. We all know in what year Christopher set sail for foreign lands to pillage indigenous peoples, but my History calendar gave me a new fact. Evidently, the same year in which the crown sent Columbus to a new world, they began to dismiss Jews from the country (Spain) – en masse. Even in my pastoral, post-Easter stupor, I have found a bit of inspiration. Alright, you can go back to your naps, now. 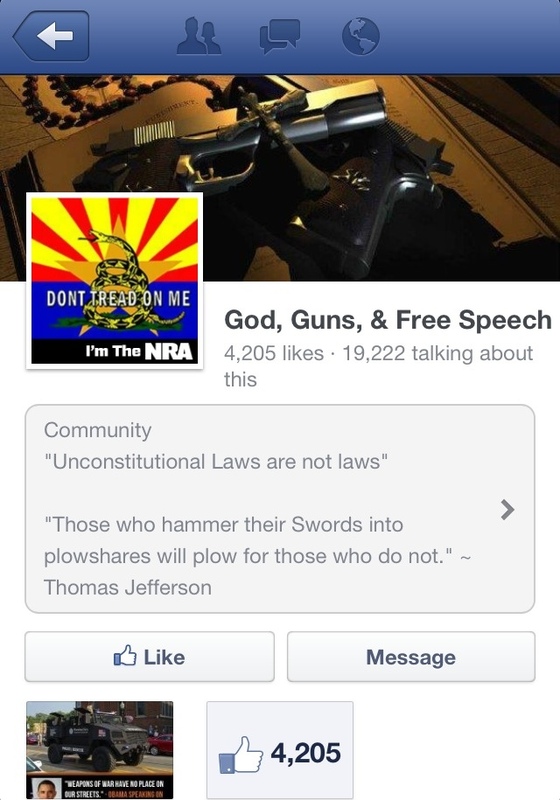 First problem, any organization whose profile picture combines the “Don't Tread On Me” snake and the NRA acronym sitting atop the Arizona state flag, should be approached with extreme caution. Apparently, this is a Facebook group. It exists, and has 4,200+ followers. YIKES! Another problem is the group's name – “God, Guns & Free Speech.” If you are going to perform any act of alliteration with the name of God, you should ensure that the next word isn't “guns” – or any of the words after that, for that matter. The third problem I spot is their line about “unconstitutional laws.” This is – technically – a true statement. However, just because you disagree with a law, doesn't make it unconstitutional. It's kinda like how you are entitled to your own opinion, but not your own facts. This seems an important distinction to make when you speak to radical gun nuts. Finally, it's important to note the highlighted quotes. The one which shows most prominently is the one noted in this screenshot – from Thomas Jefferson. There has been enough shoddy scholarship surrounding Thomas Jefferson – thanks to David Barton and the Cult of the Constitution(tm) – that I won't delve into it, lest I become a culprit. What is true to say, without a doubt, is who groups like these choose to quote when making their arguments for “god” and guns. They never quote Jesus. They rarely quote scripture. In fact, this quote from Jefferson is a direct refutation of the well-known quote from Isaiah 2. The fact is that groups like these – and all the other communities claiming the name of God right along their greater devotion to the 2nd amendment (a splinter group from the Cult of the Constitution(tm)) – often ignore scriptural themes like non-violence, especially when it doesn't line up with their desires or interests. The “god” these people are referring isn't the God they think it is. If they wish to use a lower case “g”, I would gladly drop my objections to their organization's motivations. If that “G” stays in the upper case, then there remains a problem. The Resurrection Through the Eyes of Rob Bell–MUST SEE! My friend, @csalafia, posted this video from Rob Bell. I had to share. Hope it blesses you like it did me. POLL: What do you think about ‘Monumental’? The big day is tomorrow! Monumental opens in some theaters, across the country, tomorrow. I just wanted to get your thoughts.